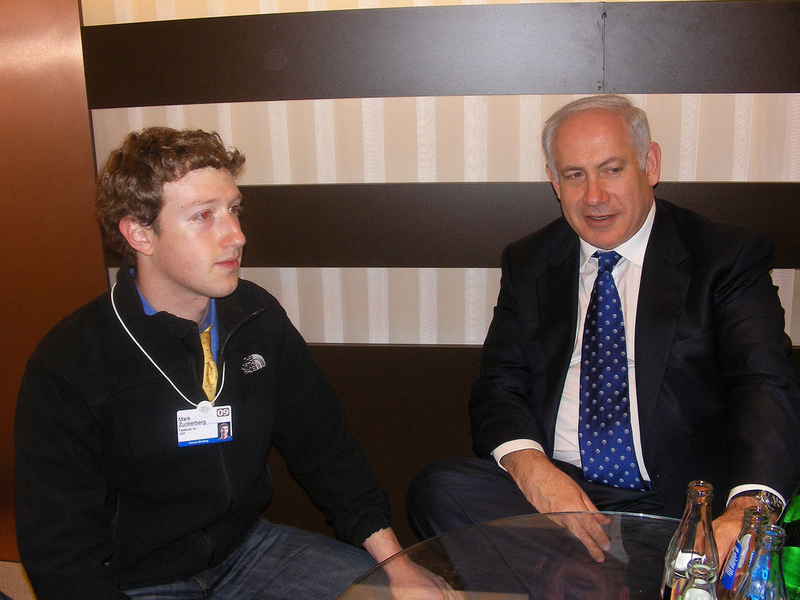  Will Facebook shadowban Israeli PM Netanyahu’s alleged fake news? 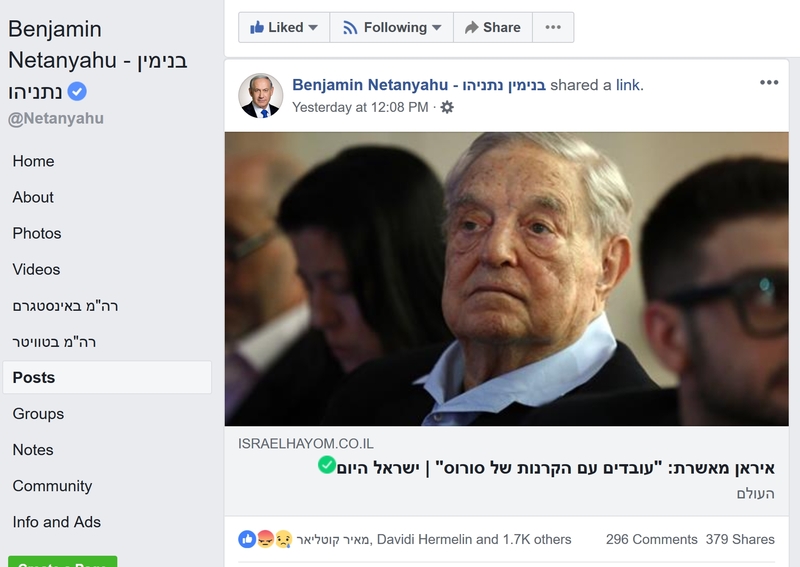 Israeli PM Benjamin Netanyahu yesterday shared on his Facebook page a news article that claims “Iran admits to having ‘worked closely’ with George Soros network”. After it was called out as fake news, activist lawyer Shachar Ben Meir is demanding the social network shadowban the post. The article (here’s an English version) claimed that during a Q&A session in the Iranian parliament, Foreign Minister Mohammad Javad Zarif admitted that Iran had worked with Soros’ Open Society Foundation. The unsigned article was published in Israel Hayom, a pro-Netanyahu newspaper owned by right-wing billionaire Sheldon Adelson. Netanyahu shared only a link to the article, adding no words of his own, on his Hebrew political page (which is separate from the official Prime Minister’s page). Journalist Nadav Eyal fact checked the story and tweeted his findings, calling it an “Iranian antisemitic conspiracy theory” that “made its way to the Facebook page of Israel’s Prime Minister”. The Israel Hayom story, Eyal speculated, originated in a post by a used named lurker on Rotter.net, a message board popular with right wing web denizens and frequented by journalists looking for leads and stories. The language on lurker’s post is similar to that of the IH article, which was published about 1:20 hours later. Eyal claims both lurker and IH misreported the story due to a mistranslation. lurker linked to 2 Farsi articles his story is based on, published by BBC’s Farsi news and Iranian news agency Irna. He quoted excerpts from them in the original Farsi, alongside English translations. Feeding the excerpts to Google Translate, Room 404 got lurker’s translations verbatim. Several Farsi speakers, including academics, whom fact checking Eyal consulted about this, “rolled on the floor laughing when they heard that this is the headline, that Iran is confirming that it works with Soros”, Eyal tweeted. “Zarif, according to them, is blamed for speaking with a Soros funded institute over a decade ago, and gets repeatedly blamed by antisemite, extremist conservatives that [Iran’s] reformists are Jewish puppets”. Eyal added that “the Iranian extremists are trying to link reformists to the Jewish Soros, who does on fact want their theocracy toppled. What does the PM of Isreal do? Disseminates a snippet from an Iranian Parliament discussion based on antisemite fake news, that originated exclusively from mistranslation, against a fellow Jew. Because [Soros] is, I’ll spell it out, a leftist”. Why would Natanyahu and IH even want to smear Soros? The answer is all over IH’s article, which claims that “George Soros’ Open Society Foundation has often been accused of promoting anti-Israeli agenda through left-wing NGOs”. Netanyahu indirectly supported a Hungarian government campaign against Soros and blamed the left wing billionaire for funding anti-deportation campaign. A year ago, Netanyahu’s son, Yair, Facebook-shared an antisemitic dank meme depicting Soros ,lizard people, Illuminati and left-wing activists. Adv. Ben Meir wrote to Facebook, reporting the fake news and demanding that Facebook “act immediately to reduce the dissemination if the fake news” (emphasis in original). He’s basing his demand on Facebook’s ToS, which state that “[r]educing the spread of false news on Facebook is a responsibility that we take seriously. […] We want to help people stay informed without stifling productive public discourse. […] we don’t remove false news from Facebook but instead, significantly reduce its distribution by showing it lower in the News Feed”. So far, the share hasn’t been removed from PM Netanyahu’s FB page, nor was the Israel Hayom article removed or corrected. Yonatan Urich, Netanyahu’s social media advisor, told TheMarker, which first reported of Ben Meir’s actions, that “the story speaks for itself”. IH’s chief editor, Boaz Bismuth, hasn’t responded to my request for comment. Facebook was not contacted by Room 404 for this story, as the company has made it its highly unprofessional habit to completely ignore my requests for comment. 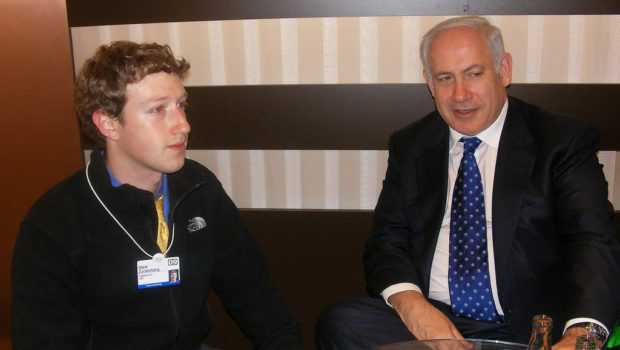 TheMarker reported Facebook hasn’t replied to their request for comment.